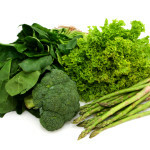 Dark green leafy vegetables are good sources of many vitamins (such as vitamins A, C, and K and folate) and minerals (such as iron and calcium). They’re also great sources of fiber. Research studies suggest that the nutrients found in dark green leafy vegetables may prevent certain types of cancers and promote heart health. It’s recommended that teens aim to eat 2 to 3 servings (1/2 cup cooked or 1 cup raw) per week. Your body needs a little dietary fat to absorb some of the vitamins found in dark green leafy vegetables. You can do this by adding a bit of olive oil or salad dressing to your dark green leafy vegetables or by eating them with a meal that includes fat such as low-fat milk or cheese. This helps to make sure your body absorbs all of the vitamins you eat. Many preparation methods and recipes for dark leafy greens already contain some type of fat such as oil, butter, or cheese in which case you don’t need to add any more to get those important nutrients. What are some examples of dark green leafy vegetables and the best way to eat them? Arugula has a peppery taste and is rich in vitamins A, C, folate, and calcium. Arugula can be eaten raw in salads or on pizza and sandwiches, or added to stir-fry, soups, and pasta sauces. Broccoli has both soft florets and crunchy stalks, and is rich in vitamins A, C, and K, folate, and fiber. Broccoli can be eaten raw, steamed, sautéed, or added to a casserole or soup. Dandelion Greens have a bitter, tangy flavor and are rich in vitamin A, C, iron, magnesium, and calcium. They are best when steamed or eaten raw in salad. Kale has a slightly bitter, cabbage-like flavor and is rich in vitamins A, C and K. Kale is tasty when added to soups, stir-fries, and sauces. Massaging kale with your hands before you eat can help reduce the bitterness. Mustard Greens have a peppery or spicy flavor and are rich in vitamins A, C, and K, and calcium. They are delicious when eaten raw in salads or in stir-fries and soups. Romaine Lettuce is a nutrient-rich lettuce that is high in vitamins A, C, and K, and folate. It can be eaten raw in salads, sandwiches or wraps. Spinach has a mild sweet flavor and is rich in vitamins A and K, folate, and iron. Spinach tastes great eaten raw in salads, steamed, or sautéed. Try adding spinach to an omelet! Spinach is also one of the best greens to add to smoothies because the flavor is so mild that it will not change the taste of your smoothie. Swiss Chard tastes similar to spinach and is rich in vitamins A, C, and K, potassium, and iron. It’s best stir-fried, added to sauces, or eaten raw in salads. Dark green vegetables are very tasty and easy to add to your daily meals. Look for them at your local grocery store and try some of these recipes! Make a salad:Leafy greens such as romaine lettuce, spinach and arugula taste great when mixed in a salad with different kinds of veggies, such as tomatoes, cucumbers, carrots, and lettuce. Add some protein such as beans or cheese and a whole grain roll or pita bread for a complete meal! Wrap it up:Make a wrap with tuna, chicken, or turkey and add romaine lettuce, spinach, arugula, and other veggies for some extra flavor. Add to a soup:Try mixing leafy greens such as collard greens, kale or mustard greens into your favorite soup. Stir-fry:Add chopped leafy greens or broccoli to your stir-fry. Chicken or tofu stir-fried in olive or canola oil with your favorite colorful vegetables is delicious! Add to an omelet:Try adding in steamed broccoli and/or spinach to an omelet for a vitamin and iron rich meal. Add to smoothies: Mixing vegetables into your smoothies will make it a nutritional powerhouse. Try spinach for some added nutrients! Sauté it: Most dark leafy greens are quite tasty sautéed in a pan with some garlic, olive oil and your favorite herb or spice. Steam it: Try steaming collard greens, kale, or spinach. Add water to a pot and place a steamer with the vegetables into it. Next, bring the water to a simmer, cover with a lid, and wait a few minutes until your vegetables are slightly soft. You can also steam vegetables in the microwave!